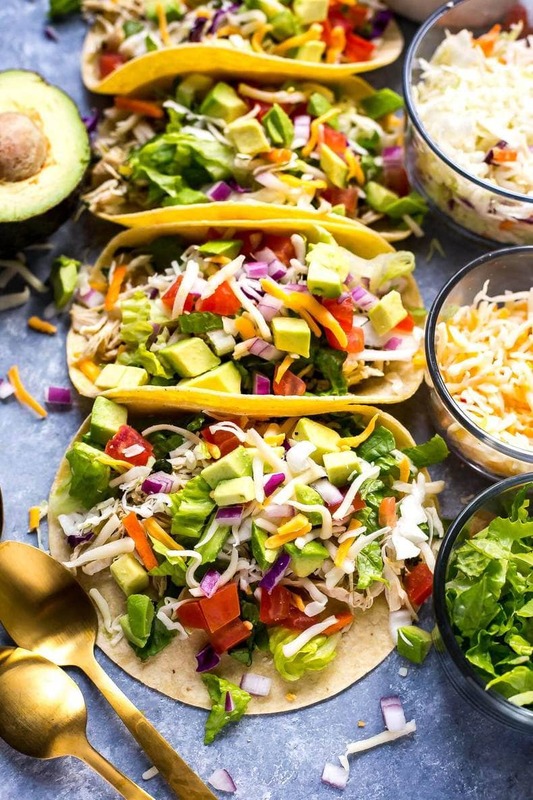 These Instant Pot Cilantro Lime Pulled Chicken Tacos are a delicious way to meal prep chicken breasts for the week – with less than 10 ingredients, they're ready in 30 minutes! Say hello to your next weeknight dinner made in a flash. These Instant Pot Cilantro Lime Pulled Chicken Tacos are the BOMB! What makes them so special is the fact that you can get hands-off, tender juicy pulled chicken in a matter of 15 minutes; no more waiting all day for it to cook in the slow cooker, it's all made in one pot in record time! And cilantro lime chicken may just be my new favourite flavour – you can also grill it like I did with these Cilantro Lime Chicken Soba Noodle Bowls! If you have not run out and bought yourself an Instant Pot yet, you don't know what you're missing. 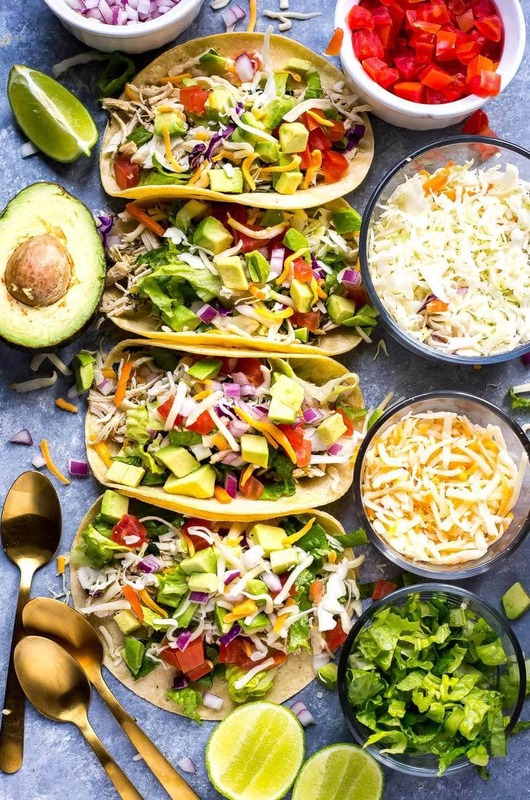 It's the quickest way to cook all kinds of fun and flavourful food like these Instant Pot Cilantro Lime Pulled Chicken Tacos or these 20-Minute Chicken Burrito Bowls. I think I'm making just about all my lunches using this thing lately? 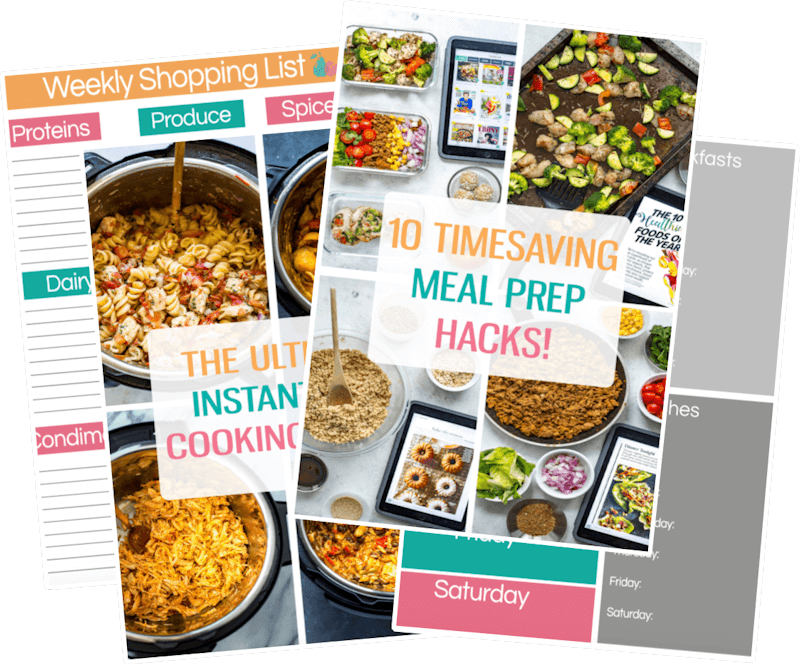 Whether you're cooking dinner for four or just want to have leftovers to enjoy all week long, the Instant Pot is great for meal prep. Dump everything in, let it cook for 15 minutes, and then you've got the rest of the weekend to yourself! These Instant Pot Cilantro Lime Pulled Chicken Tacos are so versatile and remind me of the Pulled Chicken Burritos I used to make all the time back in the day. BUT, believe it or not, it used to be a whole process for me to go through and boil the chicken, shred it, saute with all the seasonings, and then prep all the other components along with it. These days, I've got such limited time to cook that when I can save time in the kitchen I take it. 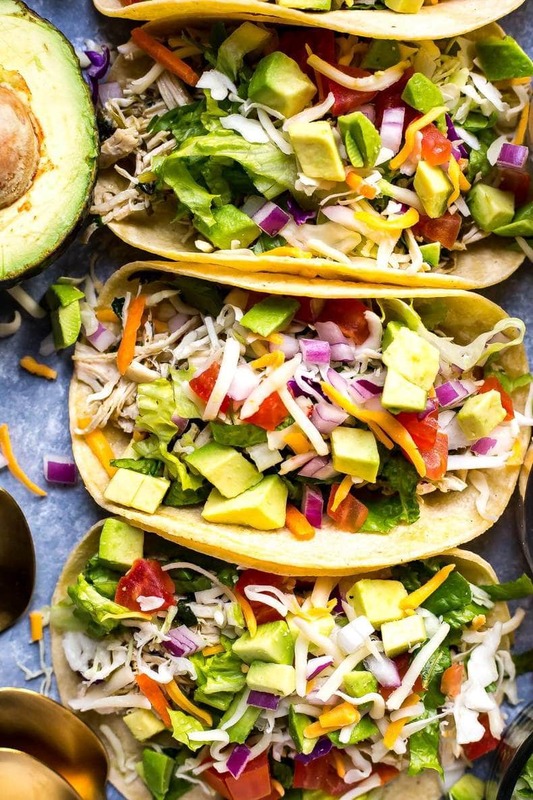 You'll basically be cooking these Instant Pot Cilantro Lime Pulled Chicken Tacos all at once in the seasonings, then shredding and dumping back in the sauce. Whatever veggies you have on hand, prep them in the 15 minutes or so the chicken takes to cook. 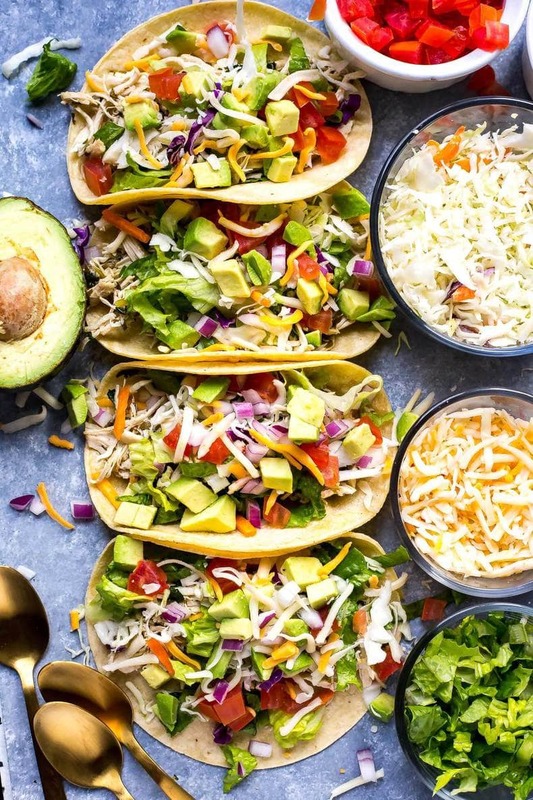 I almost always have lettuce, red onion and tomatoes on hand in the fridge or kicking around in my pantry so those are go-to options for me for veggies, and then I've added some chopped avocado, shredded cheese and bagged coleslaw mix for extra flavour. Top with sour cream and salsa, and dinner is served! 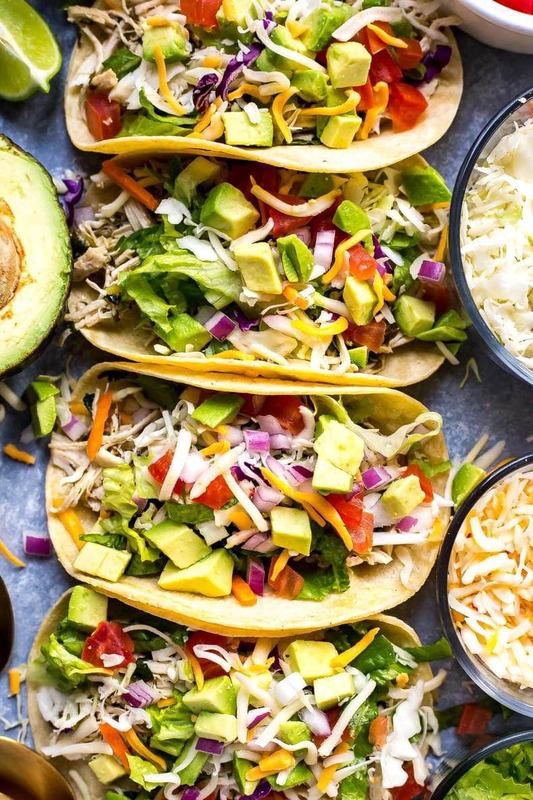 Will you be making these Instant Pot Cilantro Lime Pulled Chicken Tacos? Whether you make 'em for lunch as your weekly meal prep or make them for dinner, you'll get slow cooker style chicken ready in a matter of just 30 minutes! I'm down! I love these corn tortillas! And this is my fave taco seasoning if you don’t feel like making your own! Get your square glass meal prep bowls here for packing up your leftovers. 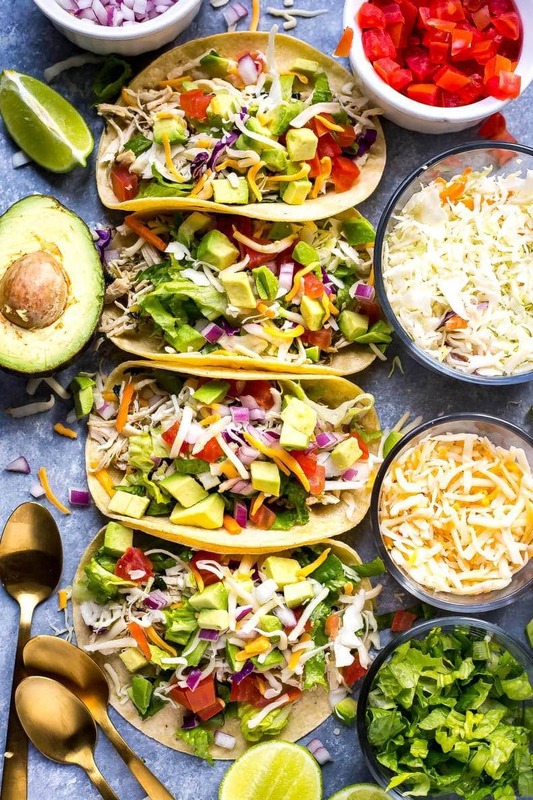 These Instant Pot Cilantro Lime Pulled Chicken Tacos are a delicious way to meal prep chicken breasts for the week - with less than 10 ingredients, they're ready in 30 minutes! 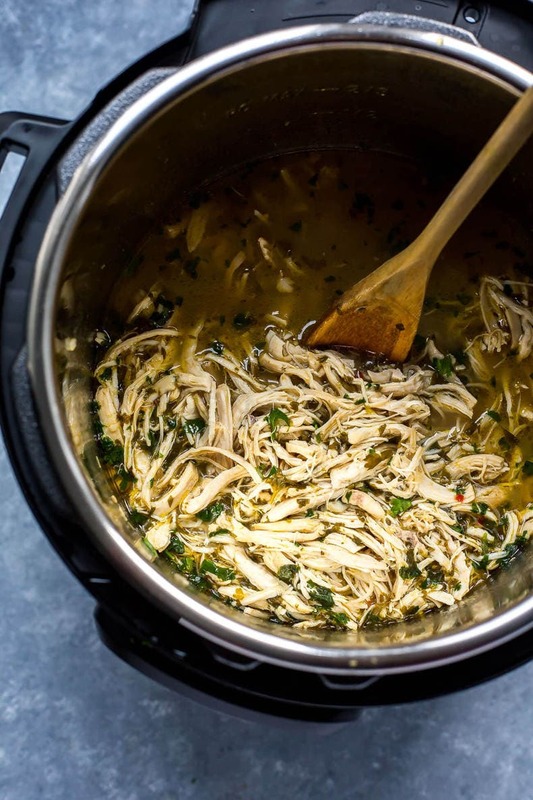 Dump all ingredients for chicken in Instant Pot, adding half of the cilantro and saving the other half for after. Add raw chicken breasts last. Set to manual and pressure cook on high for 3 minutes (add 2 more minutes if using larger breasts). Instant Pot will take about 10 minutes to pre-heat and then the 3 minutes to cook. When complete, press cancel and do a quick release of the steam, waiting until the pressure gauge drops back down and the lid is safe to open. Remove lid and chicken breasts. Shred with a fork or wait until chicken is cool and pull apart with your fingers. Add back to Instant Pot sauce along with the remaining half of the fresh cilantro. Stir well until everything is combined. Chicken will be sitting in extra liquid so use a slotted spoon to serve. Add chicken to warm corn tortillas along with toppings of your choice. Serve and enjoy! Can’t wait to try these. Thanks for taking the time to post. I have a 6 qt InstantPot. Will the chicken be done after 4 minutes? I don’t want to over cook but want it tender. Hi Lori! I made a typo, it is done in 3 minutes (I just made the correction!) I have the 6 quart as well so it will definitely work! The Instant Pot takes 10-15 minutes to come to pressure, then pressure cooks 3 minutes so the total cook time is closer to 20 minutes. The chicken will definitely be cooked in that time! I didn’t believe that 4 (or 3 minutes) would be enough time so I did 10. Chicken was still raw. How big were your chicken breasts? Super disappointed. Hoping a few more minutes when it all comes back to pressure will fix it. Hi Stephanie – I’m so sorry to hear the trouble you’ve had. What kind of Instant Pot are you using? What size is it? Did you have the Instant Pot on high pressure (not some other setting)? Were you using frozen breasts, or bone in breasts? I’m just trying to troubleshoot what went wrong here. I’m using boneless, skinless chicken breasts that are medium-sized. I also have a 6-quart Duo Plus and I cooked 3 chicken breasts on high pressure for 3 minutes. Usually it takes 10-15 minutes minimum to come to pressure, then pressure cooks 3 minutes so you’re looking at closer to a 20 minute cook time on the chicken. I have tested this particular recipe twice now and have used the same timing for whole chicken breasts several more times and the breasts always come out perfectly for me – it’s really my no-fail go-to method. Hoping you can provide me with some more specifics so we can get to the bottom of this! I have a 6 quart as well and just followed these directions. 3 minutes was not enough time as the chicken was still raw once I tried shredding it up. I repeated the steps and did another 3 minutes. It came out perfectly! Looks yummy! Can’t wait to try these! I have a 3 quart and I would love to make these with my frozen chicken breasts! How long should I cook them for? Hi Jill – unfortunately I’ve never tested these from frozen so I really couldn’t tell you. For the 3-quart I would recommend cutting the recipe in half unless all the ingredients are below the maximum fill line, in which case you would be fine to follow the instructions exactly! If you’re looking to do these from frozen, I would recommend looking at other recipes online for pulled chicken that use frozen chicken breasts to see how to adjust the cooking time and then follow my ingredient list from there. Hope this helps! I’m new to the IP. In my research, I’ve seen some people do rice at the same time in the pot…referred to as pot in pot(?). Do you think I could do that with this recipe? If so, how do you think the the timing would work out? Hi Jamie! I have actually cooked rice in the Instant Pot at the same time in this recipe: https://thegirlonbloor.com/20-minute-instant-pot-chicken-burrito-bowls/. Because you are cooking the breasts whole and then shredding with this recipe, I’m not sure that I would advise you cook rice alongside it because I’m afraid the rice would soak up all the liquid. Wish I could be of more help here! Hi Kaitlinn! I haven’t tested this myself so can’t guarantee results, but based on my knowledge of the slow cooker I would say follow the ingredient list and then cook on low for 8 hours, or high for 6 hours. 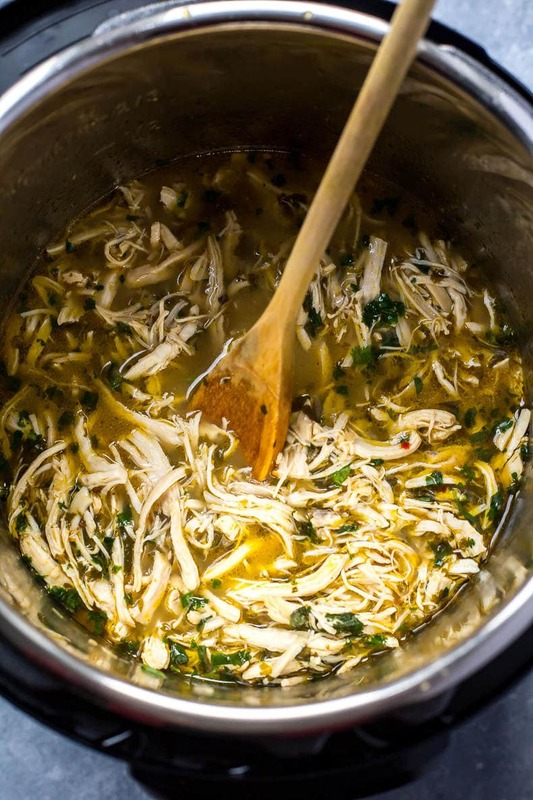 Pull the chicken apart afterwards just like you’d do with the Instant Pot, and then soak back in the sauce and add the remaining fresh cilantro. Let me know how it turns out if you try it! Tried this recipe today. Thanks for taking the time to trial-run it and post! I followed the recipe as directed with 3 medium sized fresh chicken breasts in my 6qt Instant Pot and it turned out great. We used the shredded chicken as the protein for kale mix salad/rice bowls (with avocados, fresh salsa and cheese) and the chicken was mild enough for my toddlers too. We did adjust the final chicken for us; adding some salt and pepper (surprisingly, the taco seasoning didn’t make the chicken flavourful enough) and extra lime juice on top. 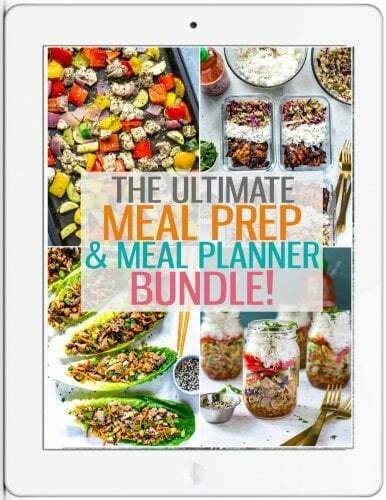 Overall, great recipe and we’ll definitely be keeping this in our meal rotation! This was delicious. I did 4 large breasts and cooked for 8 minutes with a quick release. Tacos last night and tonight having leftovers over nachos. We will definitely make this again. How did you determine how long to cook the breasts for? Have you ever tried with pork? Looks for a good pork taco recipe also!! I don’t have an instant pot, I have a crock pot. Would the recipe still work the same? Hey Stephanie! Unfortunately I haven’t tried it myself but I don’t see why it wouldn’t work in the slow cooker. If you try it let me know how it turns out! Have you ever tried these with chicken thighs instead of breasts? Just wondering how the cook time would change. Hey Heather – unfortunately I haven’t but you could give it a try. Maybe add 2-3 more minutes to the cook time and use 5 medium-sized thighs. I can’t guarantee it because I haven’t tested it myself though! I think the cooking time is off. I just pulled my chicken out of the instant pot and it was still pink! Hey Sara…it may depend on the size chicken breasts you used! I used medium-sized chicken breasts and have tested the time multiple times…maybe I will recommend a longer cook time to account for varying sizes of chicken breasts!